Last week, we talked about the actual lunch box container. Today, we’re moving inside the box to discuss some better choices for your packed lunch. The purpose of a packed lunch is to give you a good meal on the go. Sometimes we’re short on time (or motivation) and end up with a less than satisfying lunch, leaving us hungry or sleepy in its wake. We’re going to take a normal kid’s lunch and “organic-fy” it with some healthier options! I’ve kept it simple and divided these upgrades into two categories: good and great. The “Good” column gives you some ideas to clean up what you’re already eating, keeping it fast and convenient. The “Great” column takes it one step further, more organic, and more nutritious. Personally, I aim for the “great” column, but I like having some “good” options on hand for when time or motivation are limited. This is by no means comprehensive, so feel free to add your own advice in the comments! You all have some great ideas to share! Ok, back to the lunch box. We want to accomplish two big goals when we clean up the lunch box: 1. reduce artificial junk, and 2. increase nourishment. Let’s do this! Bread- watch out for preservatives, corn syrup, and hydrogenated oils. Yes, in bread (and tortillas). Don’t get me started. More on bread below. Some peanut butters have lots of added sugar, artificial flavorings, corn syrup, and hydrogenated oils. Jelly can be high in sugar, contain corn syrup, artificial flavors, and food dyes. Cut out the flavor enhancers, preservatives, and food dyes first! When you make your own bread and jam, you have full control over the ingredients, and you save loads of money! Both can be made in large batches and frozen to have on hand. Deli Meats – We wrote a great post about deli meats earlier this year. You want to watch out for nitrates, preservatives, fillers, MSG, and corn syrup. Cheese – watch out for artificial cheese products. Meats: definitely take a look at our article for recommendations on finding a good deli meat. I keep it simple and grab the Applegate products. Use a rBGH-free cheese to cut out the growth hormones. Add some veg to your sandwich: onions, spinach, tomatoes, avocado…they all taste fantastic and give extra nourishment. The added fiber and “slow” carbs will keep you feeling satisfied longer. Skip the processed meats altogether and use some grilled chicken or carved meat slices. Try to find a grass-fed AND raw cheese, if possible. Organic Valley has recently introduced one that I’ve seen at Whole Foods. Grass-fed OR raw cheese can be found more easily at the grocery store and Trader Joe’s. Also watch for hydrogenated oils, artificial flavorings, natural flavorings, preservatives, and dyes. Keep it simple and find a similar chip/cracker with a cleaner ingredients list. We like all the natural plantain chips from Trader Joes, $2 for a big bag. Pop a big batch of popcorn at home and pack some for lunch. You can buy the plain kernels, pop them on the stove top, and add your own seasonings. You can also find more nutritionally dense cracker options made with black beans, flax, or sprouted grains…but they won’t be cheap. Nutritionally speaking, chips or crackers do nothing good for your diet or appetite. Pairing them with a protein helps prevent blood sugar spikes. Pack some hummus or cheese to go with the crackers and prevent sugar spikes. Skip the crackers entirely and substitute some crunchy veggies. Homemade crackers are a fantastic option! These snacks can be packed with sugar, corn syrup, flavorings, and food dyes. They’re big on flavor and have no nutritional value, so I label them as “junk” food. Organic fruit snacks skip the corn syrup, artificial flavorings and dyes. Still a “junk” food in my book, though. Keep it natural and try some different dried fruits. Berries will have the least effect on blood sugar levels, plus they’re loaded with antioxidants and nutrition. Even yogurts that aren’t “sugar-free” may still contain artificial sweeteners in addition to sugar and corn syrup. The extra “junk” overshadows any nutrition the yogurt might contain. Organic yogurts will omit artificial sweeteners, high fructose corn syrup, and dyes. Continue to watch the sugar content. Some “healthy” yogurts can still pack 30+ grams of sugar per serving. Yikes. Want to pack a healthy squeezable yogurt on the go? Try these silicone freezer pop molds. Fill ‘em up, freeze overnight, pack in the lunchbox. Save money and buy the good yogurt in larger containers in plain flavors. You can customize the amount and type of sweetener you use. Mix in fruits, granola, nuts…anything you want. One of my favorite blends: plain greek yogurt, xylitol or stevia for sweetness, dried coconut flakes, and a couple drops of vanilla extract. Even better, make your own yogurt! Many drink boxes contain flavor enhancers, dyes, and sugar. Even the all natural juices are still high in [natural] sugars and are a poor source of nutrition as many of the nutrients have already been depleted. Bottled water- hydration is the goal, so cut to the chase with water. Fruits and veggies are way more efficient sources of nutrients than packaged juices. You can buy premium waters that include extra calcium and xylitol for tooth health, but I mix some up myself. I add about a teaspoon of xylitol per quart of water when I refill my water bottle. If you absolutely want juice on the go, you can make it fresh at home and pack a thermos with it for later. Slow, masticating juicers leave the most nutrients and enzymes intact, allowing the fresh juices to keep for 24 hours. About Blood Sugar Levels: If you feel tired or hungry after eating lunch, your blood sugar took a hit. Foods that spike your blood sugar guarantee a blood sugar drop later and a cycle of hunger and sugar cravings. Blood sugar spikes over time will burn out your cell’s insulin receptors leading to insulin resistance. You can eat low calorie but still take in too much sugar, even natural sugar, through grains and fruits. If this is a concern for you, choose fruits and grains with lower a glycemic index to help keep your blood sugar stabilized. Homemade bread: Raise your hand if baking bread from scratch intimidates you. You’re not alone. It can seem daunting until you’ve had some practice, but don’t overlook this awesome option. Homebaking lets you use quality ingredients like organic grains (buh-bye GMO’s), honey instead of sugar, and you can add in extra nutrition boosters like seeds, spices, or flax. You can look forward to a special homemade bread write-up in the future! Nut Butters: If you’ve never tried making your own nut butter, give it a go! I like to use a food processor, but you can also use a good blender. In all honesty, I don’t do it that often. I frequent the nut butter section at Whole Foods for freshly ground peanut butter and almond butter. Once I get it home, I’ll add a bit of salt for flavor. I like this better than the jars of natural peanut butter for one fantastic reason….no stirring! Natural nut butters will separate over time, so buying it fresh (or making it yourself) gives you a few weeks before separation becomes an issue. Jam: Canning intimidates me, and I don’t have the equipment for it, so I just make a basic freezer jam. Grab some berries, water, some kind of sweetener (I use a blend of stevia and organic sugar), a little bit of pectin, and a saucepan. Cook everything down until it looks like jam. Done. We use this as jam, ice cream topping, yogurt flavoring, meat glaze, even wing sauce. Fruits: I don’t limit fruits at all for my kids. As long as they’re eating something whole and natural, I say go for it! Treats: what kid (or adult) doesn’t love finding a treat in their lunchbox?? I add a treat to my child’s lunch every couple days. It may be a chocolate-covered strawberry, a homemade cookie, a chocolate chip muffin, or a “taboo” pack of organic gummy snacks. Streamlining: If you have to pack a lunch daily, like I do for my preschooler, planning ahead will save you lots of time. [I’m saying this to myself, because I’m a terrible planner. Terrible.] Our school year starts today, and I’m trying to be good and plan lunches and snacks for the week. I’m finding the suggestions at 100 Days of Real Food so helpful. Tonight, I’m cooking up a batch of muffins (for breakfast and lunch), popcorn, and cheese crackers. Hopefully, by having some snacks on hand, it will make the lunch box packing go more smoothly. 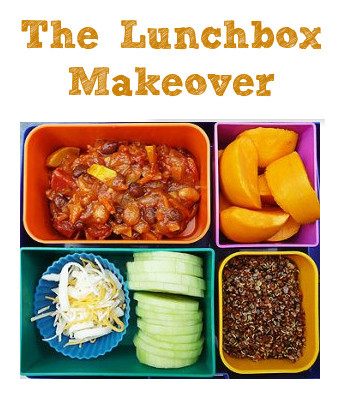 What tips do you have for streamlining the healthy lunchbox? I still feel a little challenged in the time-management area. Variety: I give him a little bit of 5-6 different things to eat. More choices, more exposure, more chances he’ll eat something good for him. Cut it Up: cutting food into smaller sizes helps him to eat more quickly and lets him sample different foods until he’s had enough to eat. Even my 5th grader will eat better when the food is smaller. No idea why, but it works! Make it Cute: I’m sure it has nothing to do with my Pinterest infatuation, but even my kids like it when their food looks attractive. Inspired by bento box designs, I’ve started “playing” with my food. 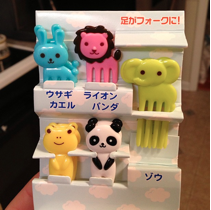 On Amazon, I found a bunch of different bento box food items to help “cute” up a lunch! The hands-down favorite has been the food picks, $4.25 for 10. I didn’t realize three boys would fight over who gets a panda in their strawberries, but they do. Any other cute ideas? Little Chef: I’ve started getting the kids involved in packing their own lunches. I think it gets them a little more excited about their lunch, which helps them eat better. It is also (hopefully) training them to feed themselves well once they leave the nest. Clean House: Keep junky or treat foods out of the house (or at least out of sight), making only healthy options available. Then let your little one choose whatever they want for lunch! They feel like they are in total control; you know they can only choose from good stuff. Win-Win. We’d all love to pack a healthy, delicious, well-balanced, filling, organic, affordable lunch everyday. If you can manage that, go for it! However, remember the point of the packed lunch: nourishment on the go. If you’re finding a complete overhaul overwhelming or difficult, take a step back and see what change(s) you can make without losing your sanity or wrecking the budget. Enjoy any victory, no matter how small! If I had to prioritize which changes to make, I’d start by cutting out any foods that contain MSG. Monosodium glutamate (MSG) is a flavor enhancer, added to make foods taste better and fresher. Chemically speaking, it’s composed of 78% free glutamic acid, 21% sodium, and 1% contaminants. In your body, free glutamic acid acts as an excitotoxin. A 2005 article states “when an excess of food-borne excitotoxins, such as MSG, hydrolyzed protein soy protein isolate and concentrate, natural flavoring, sodium caseinate and aspartate from aspartame, are consumed, these glutamate receptors are over-stimulated, producing cardiac arrhythmias. When magnesium stores are low, as we see in athletes, the glutamate receptors are so sensitive that even low levels of these excitotoxins can result in cardiac arrhythmias and death.” Also notice that aspartame and “natural flavoring” are also included in this statement. Pretty please. Avoid MSG, friends. From lunch this week to breakfast next week, we’re continuing the Back to School Series with school day breakfast ideas! We’re going to talk about some nourishing breakfast ideas that will give the whole family a (quick) strong start without relying on convenience foods! Let me know if you have any specific ideas or questions!